What is Thermal Imaging or Thermography ? 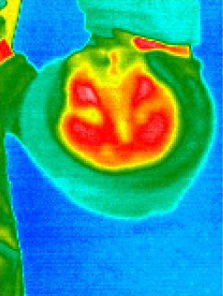 Thermal imaging or thermography is a non-invasive imaging technique designed to measure differences in surface temperature of the horse, dog, human, saddle or other animal or object being imaged. 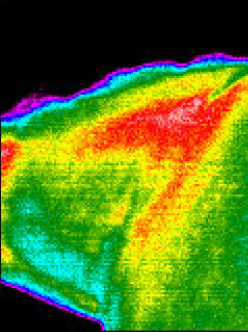 Thermal images can depict areas of heat, inflammation, cold and reduced blood flow in the muscular, vascular, skeletal and nervous systems. Because the thermal imaging camera can detect temperature differences of less than 0.05 degrees centigrade, which is 40 times more sensitive than the human hand, the location or “WHERE” of these changes can often be detected before they can be felt or visually identified. 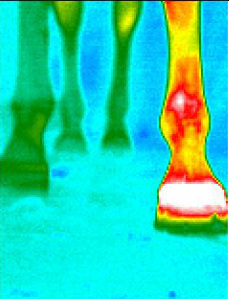 A two year research study conducted by Tracy Turner, DVM on racehorses concluded that thermal imaging was a very helpful tool to aid in the diagnosis of lameness and could detect areas of injury up to approximately two weeks prior to the horse exhibiting clinical symptoms. 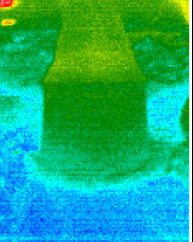 In cases where there is an indication that something is a bit “off,” thermal imaging can also help pinpoint the “WHERE” as depicted by the red and yellow areas in this lateral (outside) image of the hock. This can aid the vet in the diagnosis and treatment of the animal. It can also greatly assist the bodyworker to provide more focused and informed services during the recovery process. Heat is emitted from almost everything, even an ice cube or snow, in the form of light waves (unless the temperature of the object at hand is truly absolute zero.) There are light waves that can be seen with the naked eye and infrared red (IR) light waves (as well as ultraviolet light waves) that can not be seen with the naked eye. The IR light spectrum has three types of light waves, of which thermal-IR, also known as heat, is one. 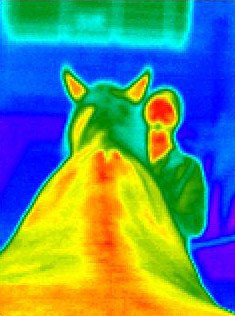 In simple terms, the IR camera measures the heat (thermal-IR light waves) emitted from the animal or saddle and converts them into electrical impulses which are then displayed as colored images on the camera display and subsequently captured as pictures. 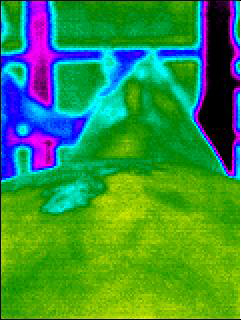 The colored thermal image picture is called a thermogram or thermal image. This image was taken prior to bodywork session #1. This image was taken prior to bodywork session #3. Left front hoof is white hot. Note heat in entire leg. This is the sole of the same horse in the image to the left. Note heat throughout, especially white areas toward the heal. This is the same horse. Note heat in shoulder and neck. When watching this horse walk, she used her neck as a lever and was bobbing to try and compensate for her foot/leg issues. Saddle pre-ride at "room temperature"
Saddle post ride. Note red on the panels near the front (pommel) of the saddle (bottom of picture). This saddle is too wide for the horse and was falling forward creating pressure points. Post ride image of horse. Note red on shoulders and withers area where saddle fell forward due to width. Saddle also shifted side to side as depicted by red along the back and spine. A typical well balanced hoof will generally be green. Some blue may be present at the bottom of the hoof if the horse wears shoes. 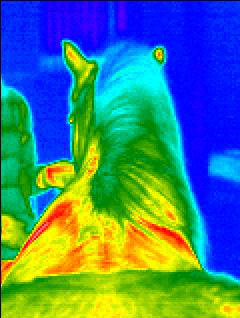 Some horses also have a thin red/yellow line around the coronet band which is normal. The image on the left is a without shoe. The image on the right is with a shoe. 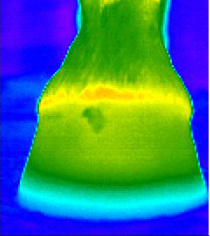 The images below depict a hoof which is not balanced as evidenced by the yellow, red and white heat signatures. Please follow the preparation instructions very carefully to ensure the best possible images are obtained. Contact us if you have any questions about the instructions. 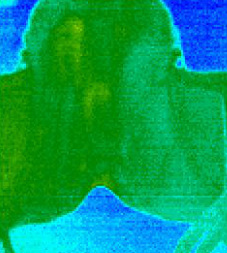 Check out our Thermal Imaging Services and Rates Page for a complete listing of thermal imaging services and prices. For additional information about thermal imaging or to schedule an appointment, please contact us or call (503) 867-1023. Holistic Horse Bodyworks does not provide a diagnosis of the animal being imaged. By law, only a licensed veterinarian can provide a diagnosis. Images taken can be provided to your veterinarian upon request. 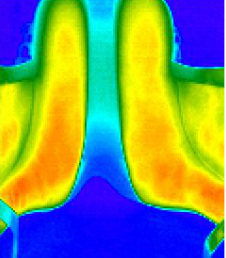 See our Thermography Services and Rates Page for details. Content copyright 2010. Holistic Horse Bodyworks, LLC. All rights reserved.